There are broadly three ways to write a popular science book. The author can focus on one particular area of science, on the life and work of a key scientist, or use some linking mechanism to pull together a range of topics. This last approach can be very successful, and is tempting to authors and loved by publishers, which implies that they sell well - but it is the most difficult approach to take. To compare the good and bad sides of such 'linked topic' books, it's only necessary to take a look at titles covering the periodic table. The less successful ones just work through the elements, or a subset of them, in some kind of pattern based on the table itself. But that results in a very mechanical approach, little more than textbook lite. The alternative, typified by The Disappearing Spoon, is to use the broad theme of the chemical elements, but to let the narrative structure carry the reader through, resulting in a far more successful presentation. 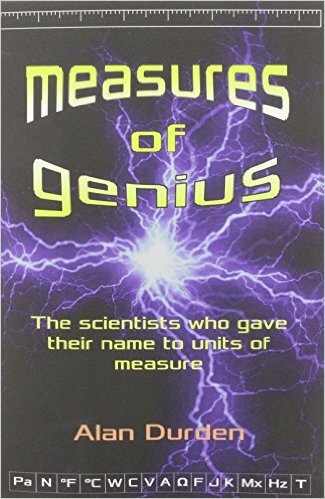 Measures of Genius is a linked topic book, pulling together short scientific biographies of historical figures with scientific units named after them. 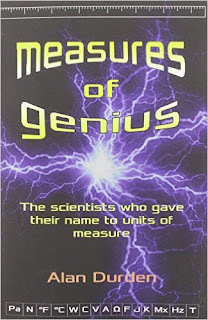 Following an introductory chapter on the nature and development of measurement, we get 14 chapters each on a scientist (in the case of Fahrenheit and Celsius, two for the price of one) who inspired a unit, from very familiar names like Isaac Newton and James Watt to those whose units are better known than the individuals, typified by Ohm, Ampere and Coulomb. However, Alan Durden does not limit himself to the specific scientist's work, where necessary pulling in other names. So, for instance, in Ampere's chapter, Young, Huygens, Arago, Fresnel and Oersted all pop up. Although the book has a linking theme, it's an arbitrary one, as the selection of scientists to provide unit names has sometimes been decidedly odd. My biggest concern was why we should care about this group of individuals. Durden provides us with plenty of facts about their lives and work, but doesn't build much of a narrative. When covering the well-known figures, the content was solid without adding a lot to the many other scientific biographies on these subjects, staying safely at the uncontroversial end of the spectrum. So, for instance, Newton's sexuality was skirted around, and though his interests in alchemy and biblical research were mentioned, there was little opportunity to understand why they were so important to him. Similarly, Tesla's chapter gives no feel for the fascinating conflict between his genius at electrical engineering and his sometimes shaky grasp of physics, leading to his dismissal of relativity and misapprehension about the nature of electromagnetic radiation. It was great, however, to find out more about the lesser-known figures. These were inevitably more interesting because there has been so little written about them, though in most case it seems that one of the reasons that they don't feature more widely is that they were rather dull people. There are plenty of facts here, and I think the book would be extremely useful as a way to get some background on the contributions these individuals made to science and technology, but I would have liked a little more flair along the way.